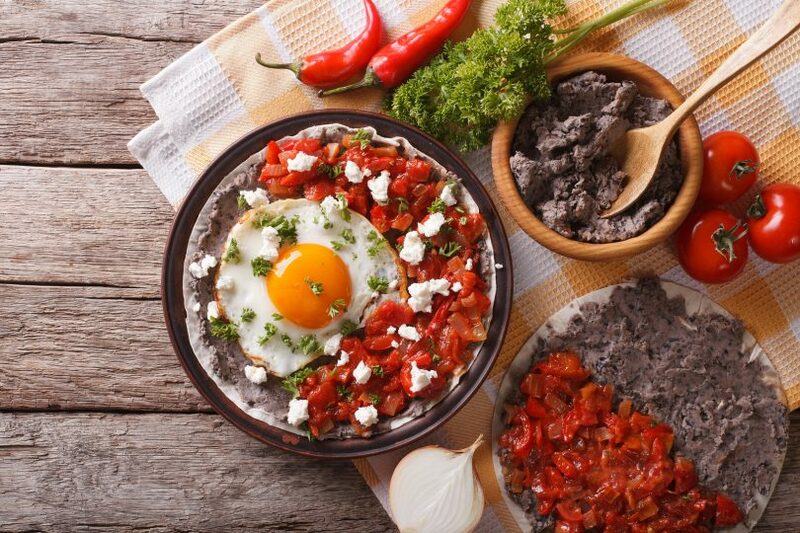 A standard breakfast or brunch dish, Huevos Rancheros are delicious any time of day. The best part about this recipe is you probably already have most of the ingredients in your kitchen. It’s the perfect too-tired-to-cook, breakfast for dinner recipe when you’re still looking for something healthy. Coat a medium skillet with olive oil. Fry the tortillas until crispy over medium-high heat, about 2-3 minutes on each side. Set to drain on a paper towel. Add the eggs to the pan with the residual oil and cook to desired preference. This dish is typically made in fried, sunny-side up fashion. In another skillet on medium heat, warm the beans. Stir until the sauce is bubbling and thick. Lower heat. Move the tortillas to a plate. Spoon the black beans over the tortillas and top with salsa and cotija cheese. Place eggs on top of everything. * If you’ve got the time, get creative! Instead of salsa use fresh diced tomatoes, chopped onions and sliced avocados. For an extra dose of healthy toppings and delicious flavors!